U.S. Congressman Brett Guthrie, representing Kentucky’s 2nd district, visited and toured the Meggitt Aircraft Braking Systems operation in Danville, Ky., on Fri., Mar. 18, 2016. Meggitt Aircraft Braking Systems is a division of Meggitt PLC, a global engineering group specializing in extreme environment components and smart sub-systems for aerospace, defense and energy markets. Meggitt Aircraft Braking Systems is one of the leading aircraft wheels and brakes suppliers in the world, with facilities in the United States, Europe and Asia employing sophisticated design and fabrication processes. It provides these systems to a diverse group of customers that includes airline operators, aircraft constructors, private aircraft owners and charter operators, governments and military operations, distributors and repair stations. Approximately 34,000 aircraft take off and land with Meggitt Aircraft Braking Systems wheels and brakes. As part of Congressman Guthrie’s visit, he will be updated on an expansion of the Danville operation later this year when a maintenance, repair and overhaul (MRO) unit will be moved from Akron, Ohio, to the Danville facilities. The move, expected to add some 50 jobs to the operation, is the first step in a significant expansion planned over the next three to five years. Meggitt Aircraft Braking Systems currently employs approximately 300 area professionals as a key generator of a high-quality, high-paying, high-tech workforce growing to meet customer needs as well as supporting a base of small-business subcontractors and suppliers in the region. “We were honored to host Congressman Guthrie. And we were very pleased to have the opportunity to bring him up to date on the exciting developments here including the very positive impacts they will have on the local economy,” remarked Luke Durudogan, President, Meggitt Aircraft Braking Systems. Congressman Guthrie serves on both the House Energy and Commerce (E&C) Committee and the House Committee on Education and the Workforce. He also serves on the following subcommittee on Commerce, Manufacturing and Trade. He is a graduate of the U.S. Military Academy at West Point, with a degree in economics, and served as a Field Artillery Officer in the 101st Airborne Division - Air Assault at Fort Campbell. For information on Meggitt Aircraft Braking Systems, visit http://www.meggitt-mabs.com. U.S. 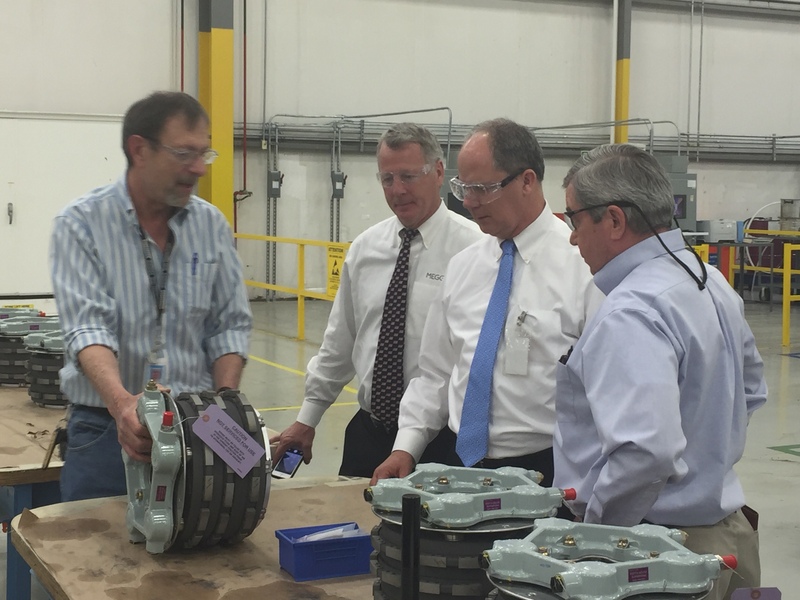 Congressman Brett Guthrie (second from right) toured Meggitt Aircraft Braking Systems and observed final quality inspections on a brake assembly. He is accompanied by Andrew Frauenhoffer, Site Director, Business Operations; Ed Boquist, Vice President, Government Relations, Meggitt; and Dave Chafin, Quality Inspector Lead.